Too often we think incentive programs and recognition initiatives are only for sales people. The truth is almost every organization will benefit from using both recognition and incentive programs as part of their overall strategy to impact corporate culture and drive desired business behaviors. Effective recognition programs are typically based on the core values of the organization (the things you want to be known for internally and externally) and should be designed to reward and recognize those behaviors that stand the test of time. 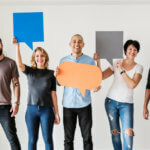 Well-designed recognition programs are critical for employee engagement, but they are not the only tool required for businesses to be successful and to increase employee engagement. Recognition programs recognize behaviors that have already happened but incentives are an important element in how you can guide and direct behaviors in an organization going forward. At their core, incentives focus on the individual and their behaviors – specific behaviors you can track and reward. Incentives focus on strictly defined, personal outcomes; that when achieved, result in a reward. As an example, a sales person is given an objective based on their previous year’s performance. If they meet or surpass that objective, they are rewarded. To keep this incentive from being conflated with compensation and to keep it from becoming an “entitlement” we recommend non-cash rewards. One of the main benefits of non-cash incentives is that you have the flexibility to start and stop them as needed without affecting your audiences’ income or lifestyle. This provides a company with the ability to change and adapt as the marketplace changes. With non-compensation based incentives you have the ability to focus attention on one objective this quarter and another next – without disrupting the income expectations of the target audience. Therefore, when thinking about incentives – look for things that need attention now – and may not need attention in the future. Look for changes in the market that you believe are “blips” or short-term needs. Need a sales spike? Run an incentive. Need to launch a new product? Run an incentive. When developing incentive activities, here are some important factors to keep in mind. Make sure incentives are the right solution to your challenge. Take the time to determine if it is a training, communication, or process issue before defaulting to an incentive program. If you’re convinced that the issue is getting people to pay attention and adopt an unfamiliar or new behavior – then try an incentive. Use non-cash awards. To remove the connection between the incentive and the long-term employment contract, non-cash awards are best used when possible. Set short-term time frames for programs. No more than 90 days. Setting long-term objectives reduces the effectiveness of the program and increases the award amount needed to maintain program attention. Tie the award criteria to specific behaviors, not just outcomes. Incentives tied solely to an outcome can create unintended consequences. If you reward people for simply submitting 100 referrals you will get 100 unqualified referrals. Ask people to submit referrals for qualified people you get referrals for qualified people. Do not overvalue the awards. It is better to have a slightly lower value for the award than to go overboard on the award value. When the value of the award far exceeds the effort involved you will get unintended consequences, cheating, and duplicity in your program. Take breaks when using incentives. Don’t always offer incentives in 90-day increments back-to-back. Offer an incentive (if needed) then withhold for 30 days. Then offer a different incentive. Make sure your incentive does not violate any of the values of your organization. The values and criteria in your umbrella recognition program are the guidelines for all other activities. Your incentive should never send a mixed message to your audience. Create a “review team” for incentives. Create a team of managers from different areas of the company to provide a much needed double-check and sounding board. Including non-participating managers from different departments/divisions will ensure you’re seeing the big picture and have thought through the incentive application. Often, outsiders see the holes in the program design – and can be a great added point of view. Accompany incentives with public recognition. According to the Incentive Research Foundation, 40% of incentive programs are now using social recognition. This will only continue to rise with use of technology and increased knowledge of the many benefits. Social recognition helps to make the award recipient feel valued as well as fosters camaraderie and reinforces the company culture. What business challenges do incentives help solve? While incentives are typically thought of in the context of sales there are many areas within a company where incentives can be applied to change behavior. The chart below provides additional areas where incentives can have an impact. 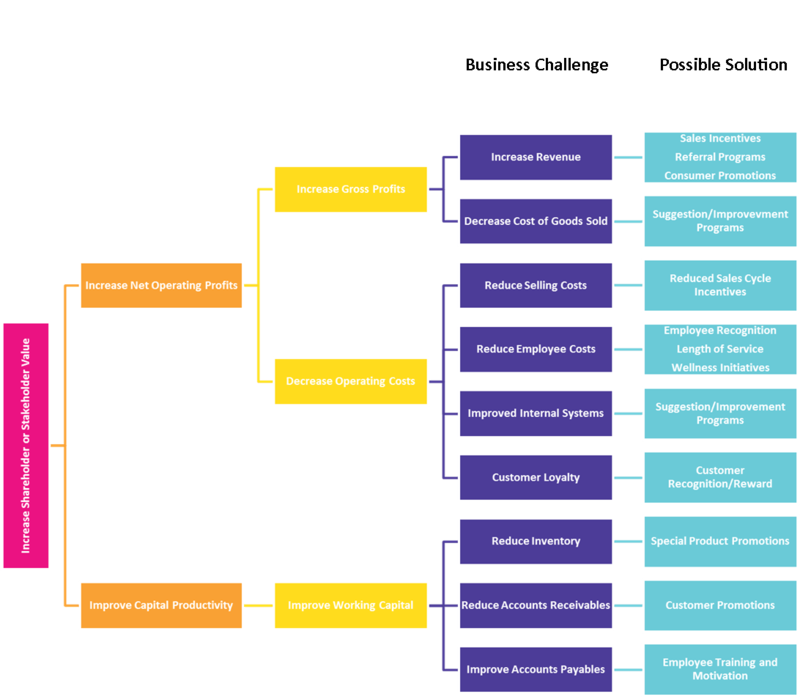 This chart is simply a starting point for you to think about how you can impact business performance with a properly designed program and is not designed to be considered exhaustive. Remember – incentives work best when they focus on specific behaviors that can be impacted in the shorter term.